Large home with beautiful lake views and a shallow kid-friendly swimming area. 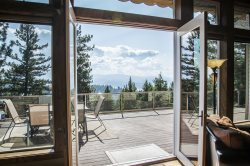 Located towards the back of serene Echo Bay on Lake Coeur d’Alene, The Arrowleaf at Echo Bay is the perfect waterfront home to relax and play. This particular area of the lake has minimal boat traffic, creating a fantastic atmosphere for the kids to splash in the water and the adults to enjoy complete tranquility. With huge vaulted ceilings, a myriad of windows, and two large decks, you and your guests will thoroughly enjoy spending time together in this home. The main level’s open floor plan features the kitchen, dining area, spacious living room—and even a kitchenette that provides additional space for meal prep or drink pouring. You’ll find plenty of space for cooking on the fully stocked kitchen’s long countertops and the bar with seating for 4 makes it easy to simultaneously socialize. There’s a seat for everyone at the dining table for 10 that’s right next to the kitchen. The adjacent living room with a TV and cozy seating completes this ideal entertaining area. You’ll also notice the tall ceilings and floor to ceiling windows that let in the sunlight and offer gorgeous lake and mountain views. Step out onto the deck and you’ll discover even more seats beckoning you to kick back and relax. Back inside you’ll find beds for 17 guests, laundry, and a great upstairs loft with a futon. The home’s master suite has a king bed, its own private balcony, and an attached bathroom that features a sizable glass shower and a jetted tub with forest views. Two other bedrooms offer queen beds and a fourth bedroom has a queen bed and a twin over full bunk bed. In addition to the master, this home has 3 other bathrooms with shower/tub combos. Head down to the walkout basement and you’ll find an entertainment room with a pool table, TV area, access to the home’s second deck, and 2 futons. Situated on an over ½ acre lot, there’s space to run around and grassy areas to set out a blanket for a picnic. You can park a boat at the 700 SF private boat or just lay out a towel and enjoy the sun. The swimming area at the shore is quite shallow, making it perfect for the kids while you watch from a nearby chair. From socializing and dining indoors to watching the sunset from the patio of your choice, you’re sure to make lasting memories in this quiet lake house. Marissa has been awesome always quick replies and helpful. Working with VRA has been good experience they helped me find a place that suited our needs, provided all the extras and supplied us with all the info needed to get settled in. Everything was on the pre check in we were able to arrange a few things extra prior to arrival. Always prompt to reply.